Over the past ten years Keane have become one of the World’s most successful and admired British bands. They have sold over 11 million albums worldwide and had many hits including ‘Somewhere Only We Know’, ‘Everybody’s Changing’, ‘Is It Any Wonder?’, ‘Crystal Ball’, ‘Silenced By The Night’ and ‘Spiralling’. They have performed 700 shows in over 40 countries. In South Korea they're known as The Autumn Band with all the wistful melancholy, melodic richness and emotional metamorphosis that implies. Their fans unfurl 'Welcome' flags in trees outside their hotels, tattoo their art-work and lyrics on their bodies, hold birthday parties in their honour, in Brazil (when they're not even in Brazil) and send lengthy letters saying their music has “saved my life”. Keane are a universal soul band. 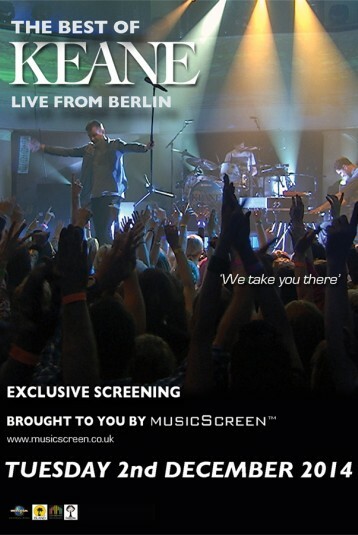 ‘The Best Of Keane, Live From Berlin’ is brought to you by MusicScreen, produced exclusively for cinema. MusicScreen brings all the excitement and atmosphere of a live music event to cinema screens around the world. Made possible by the joint skills of cinema and audio professionals, MusicScreen invites you to join with the live audience in Berlin at the iconic Goya when Keane 'bring down the house' with a special performance for their millions of devoted fans around the World. You really will feel like you are there.